This bomb is of a single-piece construction, with a semi-pointed nose. In the SAP mode the nose is filled with a steel plug. However, as an option this plug can be removed and an instantaneous nose fuze can be installed. This will prevent penetration and primarily for fragmentation effect. The bomb contains either 318 pounds of TNT or 308 pounds of 50-50 Amatol. The 1000-pound S.A.P. 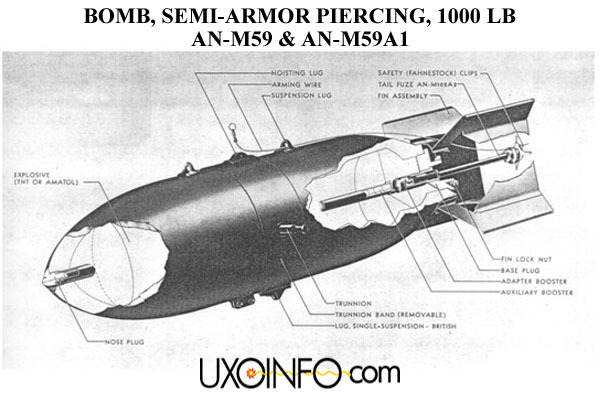 Bomb AN-M59 is designed to provide a bomb of greater penetration ability than general-purpose bombs of comparable weight.